Most of my friends in San Francisco are interested in food and good cooking. There’s something about this city’s emphasis on eating well that just gets to us; it’s impossible not to be influenced and seduced by the restaurants, the farmers’ markets, the innovation . . . the fun of it all. I have begun to see a trend that puzzles me, however. When people I know cook, they seem to do it two ways: Either they go totally all-out — and I mean no holds barred — and cook from cookbooks that require near-impossible feats of time, money, and labor. Or, on the days they don’t eat out or get something from Whole Foods, they just say screw it, heat up the Trader Joe’s ethno-prepared food, and declare victory. It’s not that no one cooks simple meals from scratch at home; some do, and often. But this bifurcation of high cooking and low cooking seems new. And, I would add, completely unnecessary. So how can we do better than pre-prepared food, without committing to extravaganzas that require an army of 20-year-olds and are based on recipes that start off by telling you to do something for two days? I live and cook by a few principles that have kept me extremely well-fed and happy over the years. None involves stress, much money, or much expertise. All stem from a desire to eat really well, to eat foods I could easily prepare myself, and to tweak foods that suit my palate, not someone else’s. #(clear n1). Use better salt and pepper, and use them judiciously. “Better” salt is basically any edible salt save iodized table salt, which can impart a metallic, chemical taste to food. Kosher salt is a good workhorse salt, but it’s fun to have a selection of sea salts readily available. A major benefit of good sea salt is textural: the larger, crunchier crystals provide localized salt bursts that make food wake up and shine in the mouth. Larger crystals resting atop the finished food remain separate components, not unlike an herb or piece of citrus zest. To take it one step further, consider flavoring your salts and finishing your dishes with them. “Better” pepper just need to be freshly ground. Nothing will ruin a dish faster than pepper that was ground months or even years ago. #(clear n2). Don’t freak out about gear. When you stroll into a high-end cooking store, it’s easy to feel insecure about your motley collection of cookware. You find yourself imagining the heroic feats of braising and broiling you could achieve if only you had that matching set of copper pots and pans. The problem, of course, is that once you have all that fancy gear, you feel compelled to produce muse-inspired food that wows your friends and does justice to these perfect, expensive tools. Needless to say, that kind of cooking rarely happens, and when it does, it leaves you exhausted, not exhilarated. In this sense, chi-chi cookware can actually be a handicap to good cooking, leaving you feeling guilty instead of proud. Who needs that? You should buy your cookware as you need it, one piece at a time. 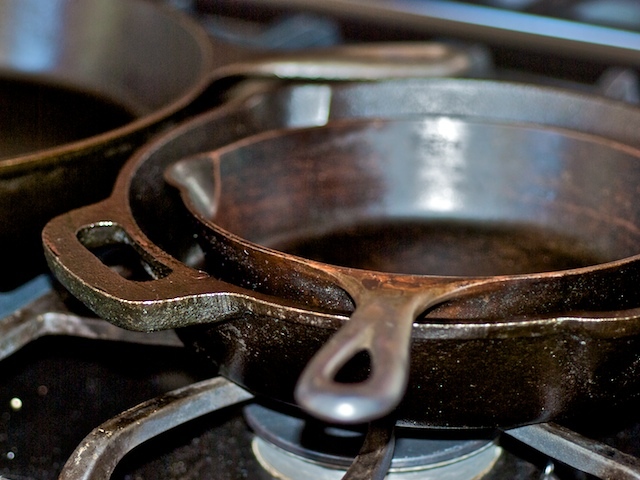 My favorite pans, those made of cast iron, also happen to be the cheapest; you can get a gorgeous 10-inch cast-iron skillet for less than $15 new or less than a buck at garage sales. Pick up a large pot to boil pasta and to make soups. Maybe splurge for a good claypot (about $30) to make great one-pot meals, and for one or two good knives (don’t bother buying knife sets). A $15 coffee grinder radically changed my entire approach to cooking, once I learned how to use it skillfully. An $8 zester is handy, too. #(clear n3). Don’t outsource your own palate. Most of us believe in the platonic ideal of cooking, of a classic, “correct” way to prepare dishes. (Japanese cuisine takes this notion to an extreme.) As a result, we abdicate our own palates and give permission to someone else to tell us what’s good and what isn’t. This is very bad. There are many ways to prepare a dish, but only we ourselves determine whether it suits our palates. If you like your dishes slightly saltier, slightly sweeter, with more umami, with more tang, with hints of bitterness, whatever, then you should cook with those notions in mind. The only “right” way to cook is the way that produces the greatest joy for you. #(clear n4). The world has shrunk. Everything from everywhere is available all the time. When I was a kid growing up in Pennsylvania, not only did we lack knowledge of or access to many of the world’s great cuisines, but we didn’t even have restaurants featuring those cuisines. Man, have we come a long way in a short time. Today we’re often familiar with the tastes of many cuisines from around the world — Middle Eastern, Japanese, Mexican, Indian, Thai — but are still unfamiliar with many of the ingredients that form the pillars of them. And we aren’t totally comfortable shopping in small mom-and-pop ethnic markets. It can be intimidating; if you're not South Asian, for example, that Indian import shop will smell and look exotic, with sari-clad women speaking rapid-fire Hindi and mysterious ingredients with labels you can’t read. Still, most of the people who run ethnic markets are delighted to help you understand the things they sell; they’ll give you recipe ideas and even family recipes. I’ve made friends with quite a few ethnic-shop owners, many of whom have become intrigued (if incredulous) with my unconventional approaches to the wonderful things they sell. Using global flavor blasts will radically improve your cooking. You can learn about the traditional uses for any given ingredient, but don’t be bound by them. Use them any way you want — no one’s looking or checking. #(clear n5). Be fearless. Courage is crucial to cooking well. As in many areas of life, fear of doing things incorrectly induces paralysis; this is devastating in the kitchen, because we wind up being too hungry to deal and just go out, order in, or pull out the TJ’s quasimeal. But how is fearlessness learned? By not caring. It sounds paradoxical, but think about it: What’s the absolute worst thing that could happen by taking risks with your cooking? That it ruins the dish? Well, yes, but you will have learned something valuable in the process. And if you’re anything like me, you abhor wasting food, and will do everything in your power to bring it back from the brink. Too salty? Add some sliced potatoes, which will absorb the extra salt. Too bitter? Consider adding a sweetener like jam or maple syrup. Learn to “repair” mistakes you make. So much about cooking is about salvaging things that go wrong. Along the way, you learn. But you have to be bold and take some risks. It’s just food, after all. #(clear n6). Cooking should dissolve, not create, tension. Are you an anxious cook who gets uneasy when someone sets foot in your kitchen while you’re preparing a meal? Ever notice how that anxiety can’t help but spread to your guests, too? And of course, the opposite is true: If you approach cooking as a practice, you can make exceedingly simple food and still have it turn out delicious if you put love and care into it. Guests can feel that, too. It’s important to examine why we cook, why we even bother. Some of the world’s best chefs are renowned for their unpleasant personalities and tendency to blow up at the first sign of imperfection. You can have masterful technique, cook in a perfectly equipped kitchen using impeccable ingredients, and still be a crummy cook, because you won’t understand that people can taste stress, anger, and anxiety in the food put in front of them, just as they can taste warmth and connection from a cook who may not be very technically proficient in the kitchen. The emotions that you put into your cooking actually matter. We spend so many hours of our lives shopping for food, preparing it, cooking it, consuming it, and cleaning up after we’re done. And most of us do it daily. If we can rise to this daily event, which comes with almost tyrannical regularity, without dread or fear or anxiety, it can be an anchoring presence for the other 23 hours of the day. The kitchen can become a stress-free zone, once we decide that’s what it should be. #(clear n7). Aesthetics matter. It’s amazing what happens when you put cooked food on a nice piece of pottery versus a scratched piece of plastic. Same food, very different eating experiences. It may seem like a hassle, but presentation makes a huge difference. If you can afford it, serve your meals on excellent plates, glassware, and table linens. As with cookware, don’t buy a “set” of anything, just pick it up one or two pieces at a time. All are worth minor splurges, considering how much time you’ll spend with them once you begin cooking regularly. I also like to offer guests an eclectic collection of chopsticks and ask them to select their own. Candles almost always grace my table, because light is important. Put some effort into it. Everything will taste better. #(clear n8). Be mindful. So much of cooking is simply paying attention: paying attention to one’s own likes and dislikes, paying attention to what looks good on any given shopping day, paying attention to the actual contents of one’s fridge. When we’re mindful of what we’re eating, all kinds of pleasant sensations occur. The bite of a ripe Pink Lady apple, when chewed with attention, wakes up the mouth. The sensory experience of slowly chewing a single smoked almond can go on for minutes, during which we can identify all kinds of smells, tastes, textures, even memories. A mouthful of something more complex — carefully cooked braised pork, say — is, for me, like plugging my brain into a sensory socket that delivers a stream of pure wonder. Preparing meals yourself encourages a greater awareness of what you’re eating, for obvious reasons: it’s you_ deciding — not a restaurant chef or, worse, the managing team of a prepared-foods corporation — what goes into your body. Becoming as aware as we can to the experience of eating is something worth pursuing. It is a rewarding and profound corridor to pleasure. p(bio).Eric Gower writes cookbooks and teaches cooking from his home in San Francisco. His latest book, The Breakaway Cook, has recently been published by William Morrow Cookbooks. He also keeps a blog.